"Art time! 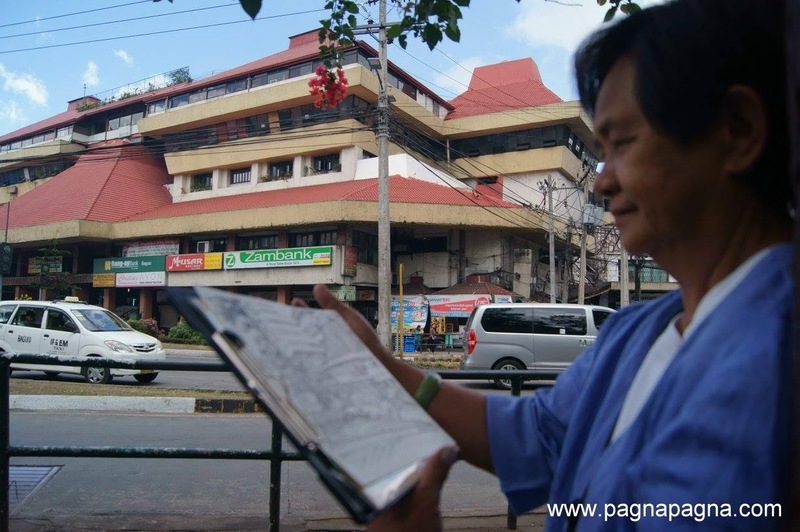 The hiker went sketching"
I sat down at the outer sitting area (along the sidewalk) of the People's Park of the Malcolm Square facing the Maharlika Livelihood Complex and took out my sketching materials. I smiled and greeted good morning to the person who came near me. He does "shoeshine" and I think that was his usual sitting area when he does his service of shoe shining. At my back was the grounds of Malcolm Square and there was an activity going on. There were lots of dogs around together with their owners. Later on I found out that there was a "free anti-rabies vaccination" sponsored by a local tv station. I went on sketching and midway on my sketching my friend arrived and we went to look for a place to eat. We searched for the "pinikpikan" (a chicken dish of the cordillera) but it was not available at that early time of the morning. We just settled for the "nilagang mais" (boiled corn with husk) where we bought it at the Dangwa Bus Terminal area being sold by street vendors. It cost 20 pesos per plastic bag with 2 medium sized pieces or 3 small sized pieces. That kind of corn tasted good. It was slightly different from the "puting mais" (white corn) which are the ones grown and sold from the lowlands of Ilocos. This one is at least much sweeter to my taste and if it were a pasta, it would be "al dente", it is much firmer than the ordinary one. It tasted sweeter than that of the usual-classic corn but not as sweet as the yellow sweet corn, it stays at the middle. It has patches of light grayish to blue violet on its kernels. The corn, which must be or a variety of "painted hill" sweet corn. We went back to the park and I continued my sketching while my companion was my photographer (in case you were curious of who took my photos) but later on he left for some important matters. A passer-by gladly took a good look on my sketch and politely said that she loved it. I finished my sketch and went on to see the "Lion's Head" monument at Kennon road. I rode a jeep bound for Camp 6. Their terminal is at Carantes street corner T. Claudio street just at the back of Jollibee Harrison road corner T. Claudio street. Just before the "Lion's Head" there was a stand still in traffic. It lasted around 30 minutes. They were clearing and stabilizing the upper slope of the landslide area. I finally got down at the monument. There were lots of visitors to the monument at that time. Private cars and vans would stop, park and have their selfie taken with the monument as their background. I just sat at the steps just across the road fronting the monument and there I started sketching. As I sketched, some people came to see what I was doing. They were usually the "taho vendors" and one was from the "mines view". The one from "mines view" was the caretaker of the big dog where you can take a photograph with the dog for a fee. He said that that dog is the cousin of the one at the "mines view" park. I finally finished my sketch. For my sketch CLICK HERE. I went near to get a closer look. the killer earthquake last July 16, 1990. Patience and plenty of time are what one needs when going back to Baguio City when commuting on public transportation. There were only few jeeps that passed by and if there was, it was full packed. I waited and after waiting some more, I finally got to ride a jeep even though i sat at the entrance steps of the jeep. I have a good view of the next car :-) . As usual there was the stand still again of traffic in that section of the road where they were stabilizing the slope of the side of the mountain and it lasted more than thirty minutes. Traffic on a stand still. That passenger jeep was my ride. I finally got back at Baguio City and it began to drizzle as I went up in the bus. It rained along the way near barangay Irisan while I was bound for Home Sweet Home.